The first step is for us to meet with you over the phone or in person to discuss your overall concept of the proposed construction requirements for your space. We request that you provide any information available on the site, drawings, layout, address etc. We provide a proposed layout with a preliminary schedule and budget. Depending on the project scope, typically this would take 1-2 weeks to complete. If you already have a design team, ACI is ready to work with your team! If you do not already have a team, ACI will implement our team of designers to generate a full design for your space. This would include, architectural, mechanical, electrical, plumbing and civil/structural if required. If you need additional interior décor recommendations, Interior decorators can be engaged as well. 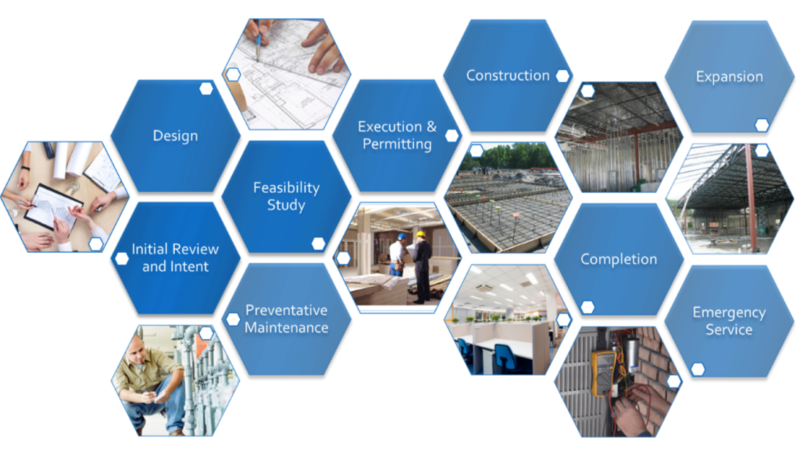 To maintain complete project transparency, we review the design progress with you when it is 30% complete and again at 70% complete. The review is essential to ensure that all design aspects are meeting the owner’s intent. Additionally, 3-D rendering can also be developed upon request. Once full design is complete, we provide a contracted quotation for the full construction of the project. At this time, we would include a specific set of specification for the project scope, schedule and implementation strategy. Value engineered options or savings for deviations from initial scope to use alternate material or modifications to design can also be provided to meet your specific requirements. Upon agreement of contracted terms, design, and construction scope and value, ACI will begin the permitting process with the local jurisdiction to obtain a building permit. ACI will facilitate the overall construction of the project. This would include managing all deliverables, site safety, ongoing coordination with designs, city inspectors, and property owners if applicable. Our contractors will ensure that all items installed are within strict accordance with project specifications and intended quality parameters. We will make sure that the predetermined schedule is met on a daily basis and will keep the owner involved with the construction progress. Upon completion, ACI will assure that all items are completed to your specifications. A certificate of occupancy will then be issued by the local building department which allows you to officially take over the space and commence business operations. Upon request, ACI can provide ongoing space maintenance which can include servicing of HVAC systems, Fire system/extinguisher renewals, or exterior maintenance if applicable. We can also provide a quarterly inspection service to assure that no operational issues are affecting the space. Upon request, ACI can provide ongoing emergency services. We respond to emergency requests with a response time within 1-3 hours (depending on urgency) to repair plumbing, electrical, or HVAC issues.